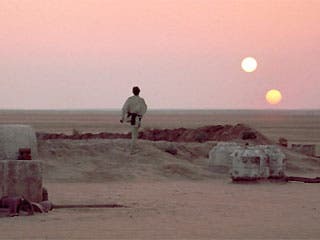 A remarkable discovery which turns once again turns fiction into reality, the Kepler spacecraft has found the first confirmed planet to orbit around two suns, much like the iconic Tatooine in the Star Wars Universe. It’s by no means habitable, however. Located 200 light years from Earth and the size of Jupiter, the planet dubbed Kepler-16b, is half rock, half gas and has surface temperature ranging from -70C to -100C. It’s not a haven for never ending sunshine either, like some of you might have imagined, since two suns are in too close of proximity. Thus, a double sunset phenomenon is experienced and once ever 20.5 days the two sun come together into an eclipse. “This discovery confirms a new class of planetary systems that could harbor life. Given that most stars in our galaxy are part of a binary system, this means the opportunities for life are much broader than if planets form only around single stars,” said Kepler principal investigator William Borucki in a NASA statement. “I am going to guess there are 2 million more such dual-sun planets,” said Laurance Doyle, the lead researcher on the Kepler-16b report. While Kepler’s main goal is that of finding Earth-like planets, Doyle, who I’m willing to bet is a big Star Wars fan, has taken the liberty to search for binary systems capable of housing planets and he’s been doing it for the past 20 years – finally he’s struck gold. Alan Boss, a researcher at the Carnegie Institution for Science in Washington DC , said “this discovery is stunning. Once again, what used to be science fiction has turned into reality,” he said. While planetary binary systems have well been dubbed a valid hypothesis up until now, they’ve more or less stayed in the realm of Hollywood. The binary system was observed after unusual signals in the data collected by the Kepler spacecraft. The data showed that the system had two stars orbiting one another, which regular intervals of brightness shift due to the eclipses. Further investigation showed a third eclipse described by additional dimming in brightness events, called the tertiary and quaternary eclipses, indicating that the stars were in different positions in their orbit each time the third body passed. The subtle drop of light from the star was attributed to a third planet, Kepler-16b.